The balcony is all yours - you called it. Grab a seat on the sofa and pass the popcorn. You can screen them later for a family vote on Silliest Face or Biggest Splash. Book, sunscreen, snacks, sand toys - sounds like your work here is done. 1.5 miles away from The Links Golf Club, 1.7 miles away from Seascape Golf Club and 4 miles away from The Golf Garden of Destin. Save the razzle-dazzle for another trip. Make this one all about low-key downtime on the beach. It’s just 250 feet, condo to sand. Even short little toddler legs can handle that. Once you’re there, here’s the plan: nothing. That’s right. No plan, no schedule, no elaborate spreadsheet of activities. You just take the day as it comes. When the crew’s hungry, eat. When you want to cool off, go play in the waves. It’s as blissfully simple as it sounds. Windancer Condominiums all have separate bedrooms, making it easier for nappers to nap or late risers to snooze ’til noon. The spacious living/dining area off the kitchen keeps everyone together, giving them space to do their own thing. And balconies let you stay outside, while keeping within earshot of the kids inside. Want to see what’s close by? Rent bikes and wheel around, walk to nearby shops and restaurants, or hop in the car for a day at the water park. 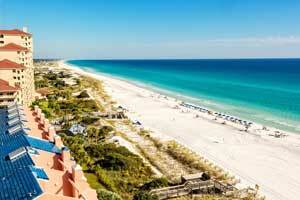 - Check-in for this property is based at 11125 US Highway 98 West, Miramar Beach, FL, 32550. Front desk is open 9:00 AM-5:00 PM daily. Guests that are planning to arrive after hours must use a phone located outside the front desk to receive codes to lockboxes with keys to the unit. For more details, please contact the office using the information on the reservation confirmation received after booking.